WE PUT YOUR SENSES IN THE DRIVING SEAT. Wilhelm Reutter founded his body shop in 1906. Ever since, we’ve been obsessed with custom mobility, and Reutter’s passion lives on in the first two letters of our brand as well as in everything we do. We’re all about making driving safer, more comfortable and more controlled – a driving experience that you can really feel. We put people first. Every time. We’re equally obsessed with motorsport. Whatever record you broke yesterday, you aspire to beat it today. That’s why we’re constantly looking for ways for you to shave a little time off your next lap – safely. Winning is one thing. But to be a champion, you need to keep learning and developing. Our seats are more than just a set of components. They’re made of innovation, quality, premium materials, craftsmanship and a serious passion for cars. From the ultimate in comfort and ergonomics to uncompromisingsporting flair, our products are as diverse and exacting as the individuals who buy them. And always in the quality you expect from RECARO. Choose cutting-edge performance that puts you in the driving seat. Enjoy the ride! FORGING INNOVATION SINCE 1906. For over 110 years, our products have combined innovation, quality and craftsmanship. Every detail counts, right down to the last millimeter. RECARO has been setting new standards for over 50 years. Our roots go way back to the Stuttgarter Carosserie- u. Radfabrik founded in 1906 by master saddler Wilhelm Reutter. The company developed and produced car bodies for all major manufacturers, including the interior fittings, so seat specialization was the next logical step. In 1963, REutter CAROsserie became seat specialist RECARO. In 1965, RECARO unveiled its “sports seat,” the very first of its kind. The automotive seating revolution had begun! Just two years later, the RECARO rallye became the first roadlegal shell seat. The success story continued with countless pioneering milestones in comfort, safety and lightweight construction. Innovation is second nature to us, and RECARO Automotive Seating dominates the car seating industry to this day. What’s more, we’re already shaping its future. The RECARO seats of tomorrow will take the unique RECARO driving experience to a new level on both the road and the race track. Did you know that in 1950, the body and interior of the first Porsche 356 sports car was built at the first Reutter plant? In 1963, Reutter sold its second bodywork plant in Stuttgart’s Zuffenhausen district to Porsche, and began focusing on its core business of seating under a new name – RECARO. Our first ads under a new name. Founded in 1963, the new “car seating company” emerged under the name RECARO, a play on words combining REutter and CAROsserie, the old German word for car body. Master saddler Wilhelm Reutter starts on the development and production of car bodies, interior fittings and vehicle seats for automobiles, both in custom production and small batches, at his “Stuttgarter Carosserieu. Radfabrik” body plant. The company produces car bodies and interior fittings for all major car manufacturers. Precursors and prototypes of the Volkswagen (later Beetle) are also manufactured by Reutter on behalf of the Porsche design studio. Car bodies, interior fittings and seats for the Porsche 356 go into production at Reutter in Stuttgart. By 1965, the company has built around 60,000 vehicles. Development and subsequent production of reclining seat mechanisms begins. Launch of the RECARO sports seat. The world’s first retrofit seat for automobiles is characterized by its revolutionary foam upholstery and distinctive side bolsters. For the world elite in touring car motorsport, RECARO launches its first racing seat with a super sturdy double shell made of the fiber-reinforced composite Kevlar – for top-level safety and low weight (6.5 kg). The new RECARO Airmatic® pneumatic lumbar support, adjustable side bolsters on the seat cushion and backrest and RECARO’s first electrically adjustable backrest significantly improve adaptability to individual requirements. Acoustic comfort: under the name RECAROfonie, the company launches a seat with stereo loudspeakers integrated in the headrest. RECARO enters the world of commercial vehicle seats, unveiling the first driver’s seat with a shock-cushioning system. The RECARO Variomed is the world’s first vehicle seat with asymmetrical adjustment options. The world’s first racing shell with head protection RECARO’s new Pro Racer racing shell revolutionizes safety standards in professional motorsport. RECARO unveils the world’s first retrofit universal side airbag seat with ABE for different vehicle models. The “RECARO shell seat” is RECARO’s first road-legal full shell seat. It raises the bar in safety, lightweight construction and comfort with a body-hugging seat shell, adjustment options and foam upholstery. The previous RECARO sports seat is renamed the “RECARO Idealsitz.” At the same time, RECARO introduces a new trademark, which has remained unchanged to this day. A world first: RECARO unveils the first vehicle seat with an integrated seat belt – the RECARO safety seat. RECARO is the first manufacturer to offer the anti-submarining seat upholstery guide, which prevents the occupant from slipping under the belt in the event of an accident. Also making its car seat premiere is RECARO’s extendable seat cushion, an added comfort feature for tall drivers. A seat that remembers. The RECARO CSE comfort seat is the first to have a memory function. The first seat for taxi drivers, the RECARO T-Line, boasts breathable upholstery. Cool cabbies: The company introduces the RECARO taxi seat, the first car seat with ventilation (RECARO Vent System®). To this day, it remains the world’s lightest retrofit seat with ABE (German general type approval): the newly unveiled RECARO Pole Position Carbon (ABE) weighs just 4.5 kg. RECARO Automotive Seating unveils the P 1300 GT, the first racing shell with fore-aft adjustment, combining top-level safety with tailored comfort. Looking to the future, RECARO presents innovative concepts for electrified and comfort-optimized commercial vehicle seats, with autonomous driving in mind. RECARO Performance Seat Edition 2019. CUSTOM SEATS. TAILORED FOR PERFECTION. A RECARO seat is like a tailor-made suit. It fits perfectly, effortlessly underlining your unique personality by combining elegance, premium quality and individual style. Only products made with passion and skill make you feel this special. Crafted to perfection using the finest materials and consistent down to the tiniest detail, they say it all. 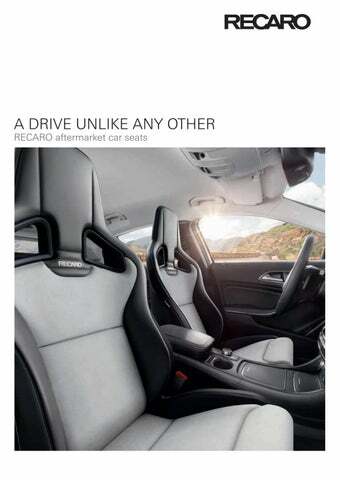 RECARO is the brand for exclusive seats made precisely to your tastes. Alongside perfect fit, they boast intelligent design that combines the ultimate in functionality, ergonomics and looks. RECARO seats are available in a wide range of upholstery materials and colors. You can even request custom or OEM materials! We’ll tailor your new seats to suit your personal preferences. deal of traditional craftsmanship goes into our seats. From the seams and cushions to the superb finish, the finely honed skills of our craftsmen shine through. Not even the tiniest detail escapes their expert eye. UNCONDITIONAL COMFORT. From the heat of high summer to a frosty winterâ&#x20AC;&#x2122;s morning, the right temperature is essential for truly comfortable seating. So RECARO came up with an ingenious system. For hot weather, the seat has a breathable membrane and air conditioning system to wick away moisture, keeping you comfortably dry, but never cold. When temperatures drop below zero, RECARO seat heating keeps you pleasantly warm. MAKE YOURSELF AT HOME. An ergonomic sitting position also means a comfortable position. Driving your car should feel like a relaxing visit to the spa after a stressful week. With a range of smart comfort features and perfect seat contours that support your body, we make every journey an experience to savor. This support is vital, as being behind the wheel forces you to sit passively – one of the worst possible positions for your body. Depending on the route, driving style and road surface, factors like centrifugal force, deceleration and vibrations come into play, which is why many drivers complain of muscle tension, circulatory problems, headaches or concentration issues on long journeys. A good car seat has to compensate for these factors with support and protection: an ergonomic seat structure, body-hugging contours, firm upholstery, pronounced side bolsters and finely-tuned adjustment options along with breathable covers, and comfort features such as heating or air conditioning. “RECARO is the best seat in the world. The RECARO Pole Position looks incredible A professional’s workplace: Many truck and bus drivers spend eight hours a day behind the wheel and cover hundreds of thousands of miles every year. They put their trust in our safe, comfortable commercial vehicle seats. whatever work can throw at you, even after a long journey. That’s because our seats work around your needs. Because we’re experts in ergonomic design. And because we know that comfort is a combination of many factors – an ergonomic seat structure, firm upholstery, intuitive control, comfortable touch and optimum climate to name a few. 21,900 hours. That’s the average time a person spends in a vehicle during their lifetime. experience that you can sit back and relish. Its snug, supportive seat structure and side bolsters for excellent shoulder and torso support stabilize the body against lateral forces, cocooning it like a second skin. Feel the difference! Everything under control? The driver’s seat plays a key role in this, especially if your driving style is sporty. The better your sitting position, the sharper your reactions and the more fully you have the vehicle under control. RECARO builds seats that support the body perfectly so that you can drive with greater concentration and safety. When developing sports seats for the road, we draw on our many years of experience and innovation in motorsport. Winners rely on RECARO: Being successful in motorsport is all about being able to rely on your equipment 100%, no ifs, ands or buts. AWARD WINNING SIMPLY THE BEST. Countless RECARO fans have voted for their favorite brand in recent years: 14 x winner in the “auto motor und sport” Best Brand readers’ poll, 12 x “sport auto” Best Brand, 5 x “auto bild” Best Overall Brand, and many more prestigious awards. This is a special honor for which we would like to say thank you. You inspire us to keep reaching for the stars. THE GO TO INDUSTRY PARTNER. RECARO fitted as standard With many car manufacturers, itâ&#x20AC;&#x2122;s often worth looking at the options and equipment lists to make sure that your new car comes with RECARO seats. The international automotive industry has put its trust in RECARO from the day the brand was born. Our customers value both the renowned quality of our products and our innovative prowess. We regularly join forces with vehicle manufacturers to develop custom solutions, be it for special editions, performance vehicles or exclusive premium cars. YOUR RECARO SEAT STARTS HERE. Your custom RECARO seat experience is just a few steps away. Take your time and begin by asking yourself a few questions. What’s crucial to me when I’m sitting in the car? What do I want from my RECARO seat? What should it look like? How does my passenger want their seat? After getting an initial overview from this brochure or a visit to our website, we always recommend a personal consultation with an authorized RECARO partner. They will listen to your personal criteria and find the perfect solution. Round off your visit by trying out your favorite seat model. Please note that the installation of RECARO seats in your car requires special baseframes to ensure a perfect, secure fit. Our partners will be happy to help. THE RECARO SYSTEM. German general type approval (ABE)/TĂ&#x153;V component certification requires a RECARO baseframe or RECARO sidemounts. Please consult your service partner for more information. The RECARO Ergomed combines luxurious comfort and superb ergonomics for the ultimate driving experience. It boasts elegant looks, premium quality and a range of customization options. As the top LIGHT needed to support product among our comfort seats, it offers HEATall the functions and adjustment options ING your body perfectly, even on long journeys. Awarded the AGR seal of quality,WEIGHT this model is available in AIRCOND. two configurations, as well as with universal side airbag. Finally, this unique seating experience comes with a climate package comprising seat heating and air conditioning. HEATCAR SEATS ING AFTERMARKET AIRCOND. RECARO Style Topline XL AIRCOND. If you love sporty design but don’t want to compromise on comfort, this is the seat for you! The RECARO Style Topline XL with a higher backrest is ideally proportioned for taller drivers. The equipment packages include everything you could possibly want, whether it’s a lumbar support, a RECARO climate package or electrically operated functions. The Sportline and Topline versions have been awarded the AGR quality seal for their outstanding ergonomics. Image includes RECARO Expert M options. Image includes RECARO Specialist M options. please contact an authorized RECARO partner (ABE/TÜV component certification only in conjunction with RECARO baseframe and sidemount). RECARO UPHOLSTERY MATERIALS Nardo: In combination with the Artista upholstery, this ultra-durable material keeps your side bolsters in perfect shape for a very long time. Velour: A robust, easy-care fabric which is also used to upholster RECARO motorsport racing shells. Dinamica suede: This exclusive suede effect upholstery is highly durable and easy-care with a premium feel. Ambla leather: RECARO Ambla leather is a highquality, highly durable easy-care alternative to leather. Leather: RECARO leather is a high-quality natural product designed for exacting requirements. Notes: Customers may provide their own bespoke upholstery materials. These must be suitable and approved for use in the automotive sector. The seat air conditioning and heating functions may be restricted as a result. For seats with a side airbag we recommend that you contact an approved consultant in advance. Current seat upholstery from selected automotive manufacturers is available on request (restrictions apply). Push your bottom as near as possible to the backrest. Adjust the distance from the seat to the pedals so that your knee is slightly bent when the pedals are fully depressed. Rest your shoulders as near as possible to the backrest. Set the backrest tilt so that the steering wheel is easy to reach with slightly bent elbows and your shoulders stay in contact when turning the wheel. Set the seat height as high as possible for an unobstructed view of all sides and all the instrument panel displays. Set the seat cushion tilt so that it is easy to fully depress the pedals. Your thighs should rest gently on the seat cushion without exerting pressure on it. Check the backrest tilt before starting the engine. Adjust the extendable seat cushion so that your thighs rest on it to just above the knee. The rule of thumb is two to three fingersâ&#x20AC;&#x2122; clearance between the seat edge and the hollow of the knee. The lumbar support has been adjusted correctly when it supports the natural curve of your lumbar spine. The seatâ&#x20AC;&#x2122;s side bolsters should fit snugly enough to support your upper body at the side without restricting it. If possible, adjust the upper edge of the headrest to the same height as the top of your head. Tilt: The distance to your head should be approx. 2 cm. and has different preferences when it comes to comfort. We recommend testing our seats thoroughly at a RECARO service partner before buying. The comfort dimensions are measured on the upholstery and seams. Small deviations cannot be excluded. The seat depth indicates the total horizontal length of the seat cushion (from the front of the cushion to the bottom of the backrest). min. 480 (XL 490)cushion: Seats with extendable seat 300 310 Minimum475 dimension seat cushion. Maximum dimension with fully max. 540with (XL retracted 550) extended seat cushion. The seat width indicates the width of the seat cushion without side bolsters. This dimension was measured 12 cm in front of the bottom of the backrest. The seat height indicates the vertical height of the backrest from the top of the headrest to the top of the seat cushion. Seats with adjustable headrest: Minimum dimension with retracted headrest. Maximum dimension with fully extended headrest. Seats with adjustable backrest were measured at a backrest angle of 73 – 74°. ID NO. : 7227353 · MARCH 2019 RECARO®, Ergomed®, RECARO Style®, Sportster CS®, Cross Speed® and Pole Position® are registered trademarks of RECARO Beteiligungs-GmbH. Seat program for Europe: this is subject to the statutory and legal guidelines applicable in the respective countries. We reserve the right to make changes to the technology, form, color and design of our products or to discontinue them. We accept no liability for printing errors.